This code was already implemented in CYPE programs as of previous versions. Now, with the 2014.m version, when Eurocode 2 (Rumania) is selected in CYPECAD, columns and beams are edited using their corresponding advanced editors. More information on CYPECAD’s advanced column editor. More information on CYPECAD’s advanced beam editor. This code does not have any capacity design criteria available. The calculation of the energy demand in buildings other than for private residential use has been implemented in the Thermal analysis tab of CYPECAD MEP. More information on this new feature can be found in the “CYPECAD MEP para España” section in the new features of the 2014.m version in Spanish. For windows on the internal envelope, adjacent to a non-useful area containing windows, such as solariums, the program establishes the effective collector area, in accordance with section 5e) of point 1.4. “Ganhos Térmicos Úteis”, of Dispatch n.º15793-I/2013. Count of the solar gain of roofs adjacent to non-habitable areas below roof level, in accordance with section 3) of point 4. “Coeficiente de Absorção de Radiação Solar”, of Dispatch n.º 15793-K/2013. Possibility of indicating the EREN portions (primary renewable energy) in heating, cooling and hot sanitary water production systems, in accordance with section 3.1) of point 3. “Necessidades Nominais de Energia Primária”, of Dispatch n.º 15793-I/2013. Arquimedes and Job control, and their connection with the Price generator, are programs which offer great possibilities for job management. With the aim to be able to exploit these possibilities successfully, CYPE has published an “online manual” which can be downloaded or viewed for sections dealing with specific tasks. This version of the Online Arquimedes manual (currently available in Spanish) is updated to the 2014 version of the program and can be accessed since the 30th April 2014. 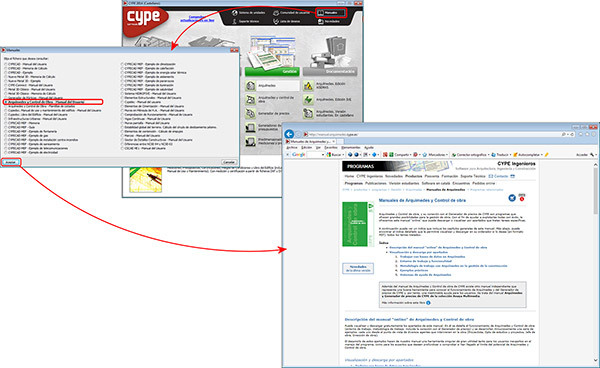 As of the 2014.m version, the Online Arquimedes and Job control manual (in Spanish) can be accessed in the “Manuals” section of the main CYPE program menu (when the programs are installed in Spanish, Spanish for Argentina, Spanish for Mexico, Catalan and Galician. Since previous versions, Arquimedes allows users to import quantities from CAD programs: Allplan®, ArchiCAD® and +Extended® (AutoARQ). 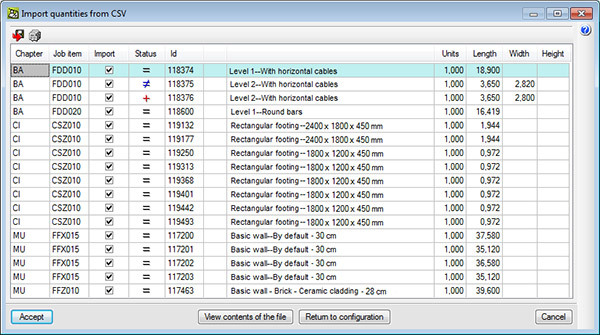 As of the 2014.m version, Arquimedes can also import quantities from CSV format files. The quantities of the job units generated by a CAD program would be provided in CSV format files directly by the program that generates them or using an intermediate tool. Therefore, this new possibility allows Arquimedes to import the quantities from other CAD programs, not only from those mentioned previously. 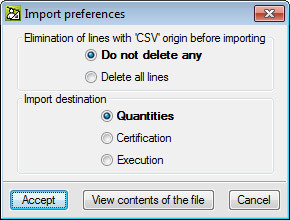 The quantity lines from a CSV format file can be imported by selecting the CSV option from File > Import > Import quantities from CAD programs. The quantity lines generated by the CAD programs include the chapter and job item codes to which they belong and a quantity line identifier (Id). The chapters and job items which the quantity lines, created in CAD programs, refer to must be included in the bill of quantities of Arquimedes to which the quantities are going to be imported. 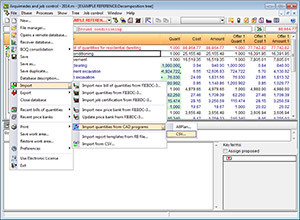 In any case, the quantity import process in CSV format to Arquimedes has options and tools which allow users to locate, in the reference database (price bank) or associated databases, job items which are not included in the bill of quantities of Arquimedes and have references in the quantity lines of the CSV file. Furthermore, Arquimedes will automatically generate a chapter: @CSV, where job items whose reference has not been found in any databases and are contained in the CSV file to be imported will be placed. This way, no quantity lines of the CSV file are lost. Additionally, Arquimedes allows users to eliminate quantity lines with “CSV” origin before importing the quantities and indicate the destination of the import (Quantities, Certification or Execution). When Arquimedes reads the quantities file in CSV format, it compares the contents with the existing quantities. For each line that is read in the CSV file, a check is carried out to see whether the “Id” of the element that has been measured is already included as a quantity line of the job item and if present, will ask how to proceed. 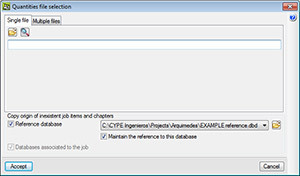 Once imported, Arquimedes displays a table in which the Status column indicates the state of the quantity line of the external file compared to the equivalent line in the database. If the line exists and is the same, a black equals sign is displayed. If the line exists, but some data has changed, a blue not equal sign is shown. If the line does not exist, a red plus sign is provided. The import process of a quantity in CSV format is similar to the quantity import process generated by Allplan®. The online Arquimedes manual (currently available in Spanish), specifically in the section on “Connections with CAD programs” has detailed information on the import procedures of quantities generated by Allplan®, ArchiCAD® and +Extended®, and will shortly include a detailed section on the “Import of quantities in CSV format” (import process, comparison, and format of the quantity import CSV file). 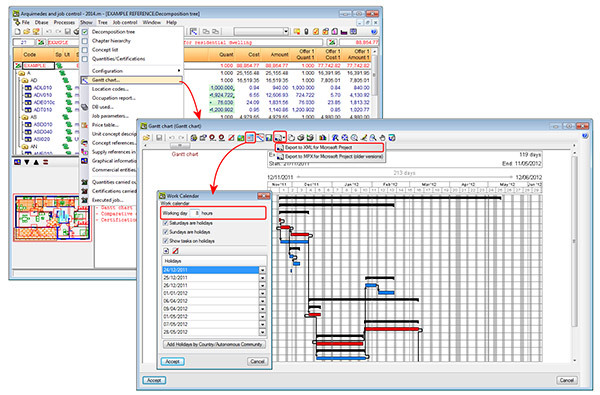 As of the previous version (2014.l), users could export the Gantt chart to XML format. Now, with the 2014.m version, when the chart is exported to XML format, the work calendar is included. The duration of the working day can also be indicated.